A great three week mix of mountains and monasteries – and almost every day brought bright blue skies and glorious sunshine to the bright, barren landscape of Ladakh. High and very dry, I’d like to return to do more walking in this part of the world – nicknamed Little Tibet, it also has elements of Central Asia which I so loved about my few days in Pakistan’s portion of Baltistan and on my travels in Xinjiang. Highlights included following the pilgrims from Himachal Pradesh around the various chapels at Alchi gonpa, the ruined palace and the old and (relatively) new gonpas in the lower Ladakhi capital of Basgo, and Spituk gonpa, perched on its rocky buttress with wonderful views out over the Indus river valley in one direction and of the airport and army base in the other! Many a happy hour was spent mooching around the old town of Leh and strolling the two newly pedestrianised streets of the main bazaar, whilst sundown at Shanti Stupa provided super views out over the town nestled between the jagged rock ridges, the tree and field lined Indus river and the embracing mountains, snow topped, beyond. The Brazil Cafe did likewise from its roof top lounge high above the bustle of the bazaar below whilst also providing proper coffee and cheesecake. 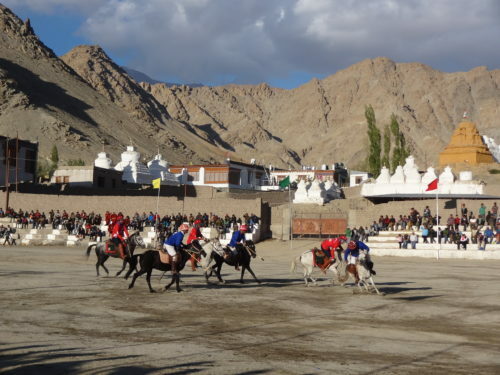 We also coincided with the 5th Ladakh Marathon, the Naropa 2016 festival at Hemis Gonpa and the Ladakh (Tourist) Festival, which culminated in a high octane polo match where we joined the local fans cheering on the Ladakhi Scouts and Animal Husbandry teams and scampering up the step seats when the players and/or the ball came hurtling towards us. Seeing everyone dressed in their best at (or going to/from) Hemis was wonderful too. The week’s sightseeing at 3500m meant we were well acclimatised for our 8 day Markha valley trek. Wonderful support from our 8 strong Rimo Expeditions team – fabulous food and lots of laughs, even if our ponies did do a runner from Nimaling! Every day took us through different environments and brought us into contact with wildlife galore – blue sheep, marmots, mountain hares and the supercute mouse hares (pika) at ground level, golden eagles and lammergeier soaring above. And not forgetting the magic views from the two passes – the Ganda La (4970m) and the Kangmaru La / Kongmaru La / Gongmaru La (5200m). 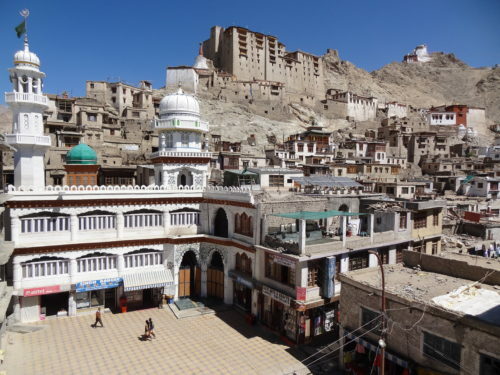 Our beautiful base in Leh was the Kang Lha Chan hotel, 5 minutes stroll from the bazaar and 2 mins from the shops and eateries that line Chanspa Road. A really lovely hotel – the tranquil courtyard garden with apricot-laden tree provided shade for afternoon teas, and beers after the trek – and super staff. Highly recommended. 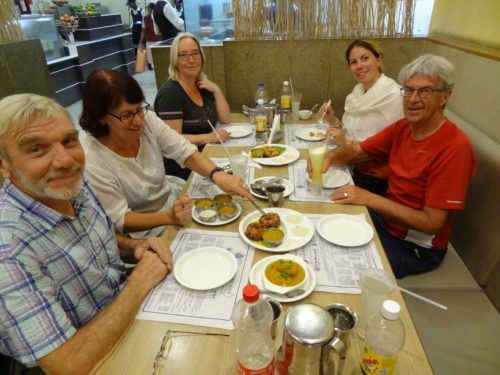 With 13 hours between flights in Delhi, we squeezed in a hot half day’s sightseeing (Delhi’s 500R foreigner entry prices to historic sights stunned us after Ladakh’s 30R norm) rounded off by a smashing Dosai Dinner at the Sarvana Bhawan South Indian Restaurant on Connaught Place…. And then the long flight home. 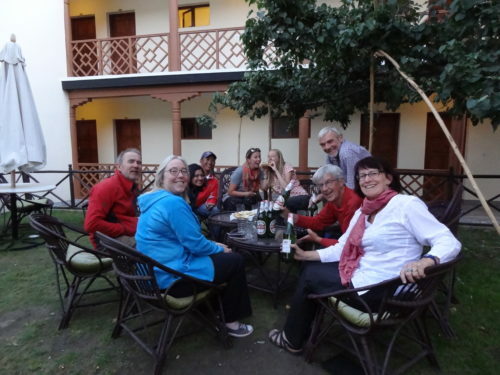 Big thanks to Val Pitkethly and Rimo Expeditions for organising, to Pemba Sherpa and our lovely trek team for taking such good care of us in Ladakh, and to Vijay and his staff at the Kang Lha Chan hotel. bought my annual multitrip travel insurance (to supplement my Austrian Alpine Club (UK) mountain rescue insurance). I’ve gone with MoneySavingExpert’s “Best Value” recommendation: LV=. Lots of the cheaper options won’t cover trips involving trekking over 2500 / 3500m. LV=’s Premier policy covers “Trekking and hiking and fell walking up to 6000 metres”. My travel jab top ups are booked for next week (Diphtheria, Tetanus & Polio (DTP) and Typhoid), and I’m hoping to catch up with Val when she’s passing through London later this month to go through the itinerary in detail. So now it’s onto the fun stuff – packing and keeping an eye on the weather, and the FCO travel advice (I’ve signed up for email alerts as/when the FCO travel advice on India changes). Flights to Leh for our Ladakh trip later this year are finally booked! Markha Valley and Gompas galore, here I come. My attempt to buy got flagged as fraud by my bank (by my January flurry of business trips and Nepal flight buying from the sounds of it) and when I called up to sort it out, the first person I spoke to was another Mary, and then I get put through to the person in the fraud team… who was also a Mary. So… what, where, when, why, who? 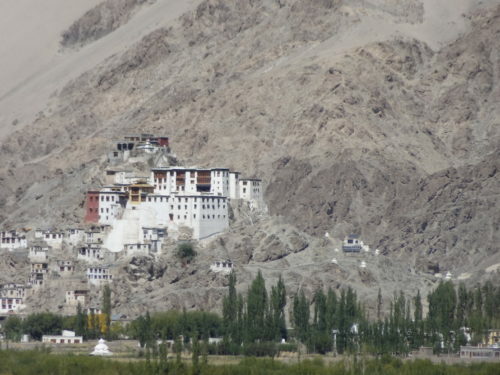 Destination: Ladakh, India – the “land of high passes”. Why: To do the Everest Four‘s long-pondered trek in the Indian Himalaya. 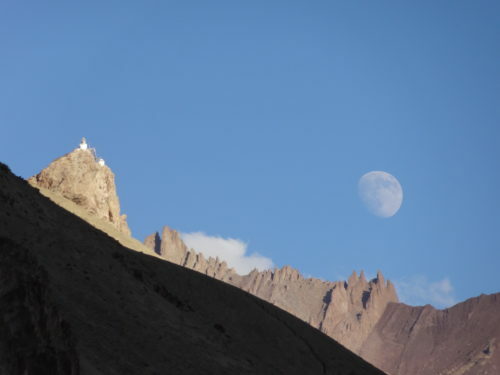 How: On a private trek in Val Pitkethly‘s capable hands, with the equally capable Yangdu and the team at Rimo Expeditions helping out on the local logistics and additional tours in Leh and Delhi. Flights booked with Air India. When: September – after the peak summer season but before the snow.